The weather is FINALLY beautiful and we’re getting our daily dose of Vitamin D. YAY! Refresh with this tasty margarita. 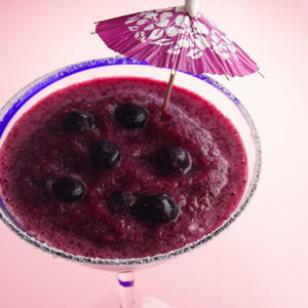 Blueberry’s are packed with antioxidants and are recommended to be consumed on a regular basis. They help prevent various disease processes such as cancer and heart disease, plus reduce blood pressure. Per serving: 125 calories; 1 g fat (0 g sat, 0 g mono); 0 mg cholesterol; 29 g carbohydrates; 0 g protein; 2 g fiber; 14 mg sodium; 147 mg potassium. Nutrition Bonus: Potassium, vitamin C, phytochemicals.